Some manufacturers require a Minimum Advertised Price (MAP). Basically that means we show the manufacturer's price and you negotiate your best price with us. That interaction with you, the customer, enables us to offer you an even lower price for this product. Thanks for clicking. 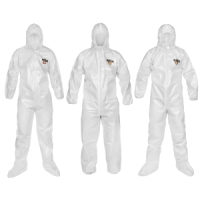 Offering quality and durability, these cost-effective entry-level suits will bar many contaminants from penetrating to inner clothing. Whether you are in manufacturing, environmental cleanup or chemical handling, ChemMAX® 1 will protect your workers. 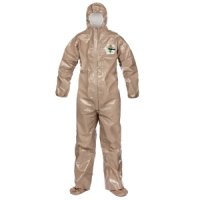 An economical chemical-protective suit to provide protection from chemical mixing and handling, environmental clean up, hazardous materials remediation and response, spray painting, pharmaceutical manufacturing and general industry. Ideal for the industrial environment, emergency responders and law enforcement. It provides a barrier against toxic industrial chemicals, dual-use chemicals, chemical warfare agents and other harmful contaminants. A proprietary multi-layer film is applied to a heavy polypropylene nonwoven substrate for increased strength and durability. Heavy-duty splash protection that's high in performance and comfort. 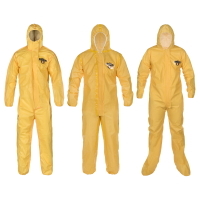 These suits can be used in work environments where hazardous contaminants may be present. 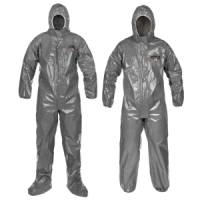 ChemMAX® 4 is top-of-the-line protective clothing and features a proprietary 6-layer barrier. Suits comes in Yellow and Tan. Copyright © 2019 Andax Industries. All Rights Reserved. Trademarks and/or patents reflect the trademarks and/or patents of their respective owners. This website is wholly owned and operated by Andax Industries LLC.